Series I addresses mastering emotional and mental wellbeing. It gives you the tools to access love, joy, and success, and how to stay up when life circumstances pull you down. Series II covers your spiritual connection and life’s purpose. It gives you new perspectives as well as tools to connect to your life force, vitality, and to live a life of true spiritual fulfillment. Series III addresses your most meaningful relationship - marriage - offering you powerful paradigms and practical tools, through which you can create the marriage of your dreams. 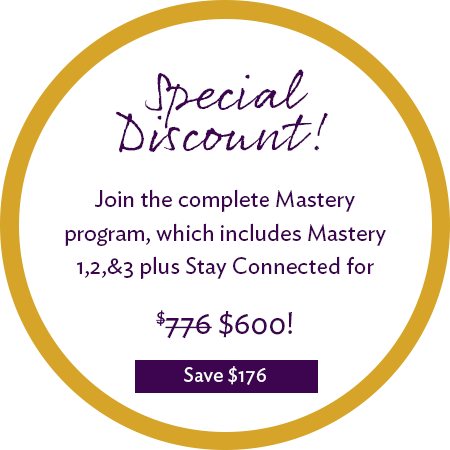 You can purchase each of the Mastery Series individually, or purchase the complete program and receive the Stay Connected-Live Q&A sessions with Dina for free. The Mastery program teaches you a way of being that is guaranteed to transform every area of your life in unimaginable ways. We at the Dina Friedman Academy can’t wait to be a partner with you in your personal transformation. Live a life of equanimity, joy, and inner peace. Complete mastery over your thoughts and emotions. Understand how all your emotions serve and guide you. Eliminate stress, anxiety, fears and resentment. Learn how to instantly change your negative emotional state into a positive one and experience life in a perpetually joyful and spiritually-connected frame of mind. Recognize and neutralize destructive thinking patterns. Become a deliberate and focused thinker so that your thoughts will promote, and not erode, your well-being. Live life with a sense of inner peace and equanimity. Anyone seeking greater levels of emotional and mental well-being and wishing to experience life as an ongoing blessing no matter the circumstances. 12 classes each approximately one hour long, available by phone or online. Frequently asked questions following each class. Program handbook with a summary of each class. An MP3 disc which contains all classes & frequently asked questions. All recordings via phone and online access are guaranteed for one year from date of purchase. Endorsed by R' Neiman of Monsey, NY. Includes Mastery 1, 2, and 3 PLUS 10 weekly live Q&A sessions with Dina! Know yourself. Love yourself. Be yourself! Accept yourself more and love yourself more. Live your life more spiritually-connected. Uncover your unique gifts and strengths. Gain tools and perspectives that will empower you to be authentic and real. Learn to differentiate between your soul and your ego, and how to access soul state. Determine your highest values and how to live by them. Discover your unique mission and live a truly meaningful and fulfilling life. Anyone who is truly seeking to live a purposeful life, and desires to achieve their full potential and experience the rewards of living meaningfully. 9 classes, each between 45 minutes and 1 hour long, available by phone and online. An MP3 disc of all classes. A practical guide to creating everlasting love and intimacy in your marriage. Women committed to an ever-expanding marriage experience of joy and love. Women seeking to heal a marriage that isn't meeting expectations. Also suitable for marriage counselors and Kallah class teachers who are seeking to gain more insights to be of better service to their clients. 11 classes, each approximately one hour long, available by phone and online. Stay Connected - Weekly Live Q&A Sessions with Dina. Past Participant? New Participant? Gift yourself! Be a part of the warmth, connection, and wisdom of the Mastery community. New participants on any of the Mastery Series who want to get answers to their personal questions. Past participants who are familiar with all the information and want to stay connected to the energy of the Mastery community plus ask questions as they come up in your life. 10 Weekly live Q&A Sessions. All sessions are recorded and remain accessible until the program completes in July 2019. Message Center: Leave successes and questions for Dina to answer anonymously. Dina responds to these questions during the live Q&A sessions. Interactive Participants Forum: Share your successes, feedback and ideas with other participants. Feel the community support of like minded women who are learning and growing just like you!